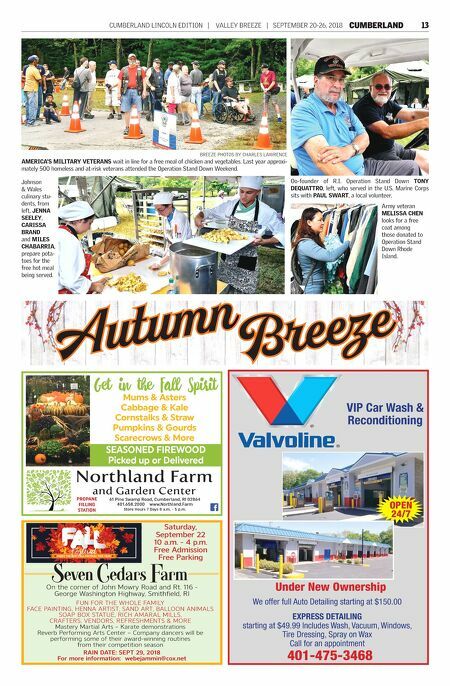 12 CUMBERLAND SEPTEMBER 20-26, 2018 | VALLEY BREEZE | CUMBERLAND LINCOLN EDITION BREEZE PHOTOS BY CHARLES LAWRENCE Volunteers, including Cumberland MAYOR BILL MURRAY and R.I. GENERAL TREASURER SETH MAGAZINER, serve a hot lunch to the veterans, including Army veteran JEFFERY DONALD who is homeless. On far right, also helping out is LT. GOV. DAN MCKEE. Serving our veterans at Operation Stand Down Burrillville Air Force veteran THOMAS BOUSQUET receives a free flu shot at the annual Outreach Stand Down Weekend presented by Operation Stand Down Rhode Island last Friday, Sept. 14, at Diamond Hill Park. 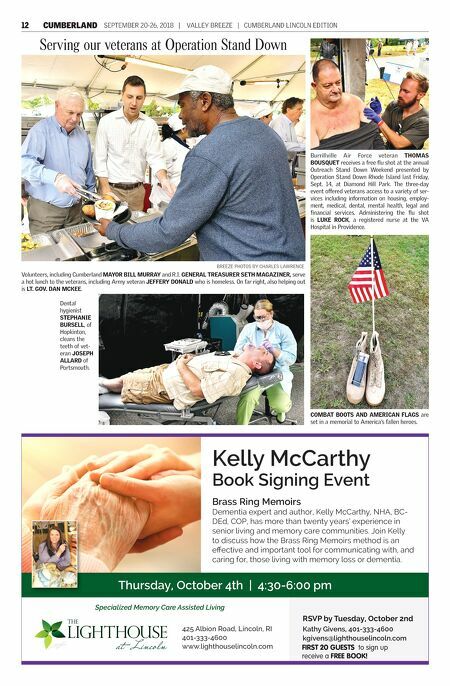 The three-day event offered veterans access to a variety of ser- vices including information on housing, employ- ment, medical, dental, mental health, legal and financial services. Administering the flu shot is LUKE ROCK, a registered nurse at the VA Hospital in Providence. COMBAT BOOTS AND AMERICAN FLAGS are set in a memorial to America's fallen heroes. Dental hygienist STEPHANIE BURSELL, of Hopkinton, cleans the teeth of vet- eran JOSEPH ALLARD of Portsmouth. FIRST 20 GUESTS to sign up receive a FREE BOOK!